Ramapuram, Pala, Oct 02, 2017: It was a touching and emotional home coming for Rev Tom Uzhunnalil, his first ever return to his native village of Ramapuram after his release from his abductors recently. He was welcomed into the Bishop’s House at Pala on October 1 by none other than Mar Joseph Pallickaparambil Bishop emeritus of the diocese who had ordained tom Uzhunnalil into his priesthood. “The reception takes me to May 20, 1990. It was on May 19 that I was ordained a priest by Mar Pallickaparambil,” he remembered. “I had always believed that my calling was to serve the elderly and the weak at the Elders Home (in Yemen). After I was abducted I thought my mission was to pray for my captors where ever they took me. But know I know that my calling is to tell the world that there is a God and he is listening to your prayers and who would grant your prayers,” Fr. Uzhunnalil said. Fr. Uzhunnalil, who arrived at the Bishop’s House by 3.30 p.m., was received by a host of leaders from all walks of life. Senior Kerala Congress leaders including Mr. K.M. Mani and Mr. P.J. Joseph, Congress leader Mr. Thiruvanchoor Radhakrishnan, CPI(M) leader Mr. K. J. Thomas and others were present. He was taken out in an open jeep from the Bishop’s House to his home parish at Ramapuram. Fr. Uzhunnalil went to the tomb of the Blessed Augustine Thevarparambil (Thevarparambil Kunjachan) inside the chapel. This was followed by the Holy Mass at the Church and a short public meeting where he spoke to his close and dear ones. 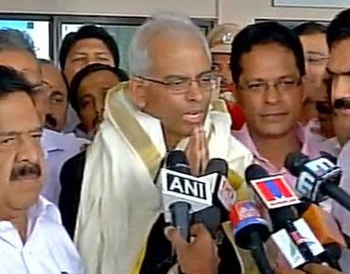 Earlier in the day, Fr Uzhunnalil arrived at the Kochi international airport from Bengaluru around 7 a.m. He was received by a large gathering of people. Leader of the Opposition Ramesh Chennithala; MLAs Hibi Eden, V.K. Ebrahim Kunju, Answar Sadatt, Roji John, and V.D. Satheesan; and Jose K. Mani, MP; were among them. People from different walks of life thronged the St. Mary’s Basilica Cathedral in Kochi as Fr. Uzhunnalil arrived around 10.30 a.m. The cathedral and its premises were packed with people even before his arrival. People wielding cameras and sacred pictures greeted him as he arrived, accompanied by auxiliary bishop Jose Puthenveettil of the Syro-Malabar Archdiocese of Ernakulam-Angamaly. Fr. Uzhunnalil, a member of the Catholic religious order Salesians of Don Bosco, was accompanied by his provincial superior Fr. Joice Francis and his deputy Jose Koickal. Addressing his first press conference in Kerala after his release, Fr. Uzhunnalil thanked everyone for their prayers and support. He recalled that people from all religious communities had offered pujas and prayers for his well-being. He said that his release was the result of concerted efforts by different agencies and people. He said he did not know who had abducted him but God appeared to have touched their hearts and called for prayers for his captors. He said he had no communication from the outside world until he was released and arrived in Oman. Fr. Uzhunnalil said he was ready to go back to Yemen if he was called upon to do so by his superiors. He reiterated that he had submitted himself to the will of God and his superiors and that at no point was he called back from Yemen even as the threat of violence and war loomed large in that part of the world. Father was luckily rescued he is back safe .